A few days ago it was Dias’ (aka Zeus), second birthday and I made him this delicious and easy to make Apple and Banana Olive Oil Cake. All the ingredients used are pure and fresh and it makes a great healthy cake, which can also be eaten by humans. I apologize in advance for the crappy photos but the weather was really bad these few days and I had to take the pictures inside the house. I wanted to decorate it differently but due to the snow I did not manage to go to the shops to buy the ingredients I needed. The day before yesterday when we celebrated his birthday, it was raining all day, so I had to take the pictures inside. The light above the kitchen table makes some awful shades and reflections on the table. The cake is delicious but a bit denser than usual cake because of the the method I used to make it but still it tasted really good. Apart from the fact that it is not sweet all the ingredients are pure and fresh and it makes a great healthy cake or alternative to dog food, which can also be eaten by us, as well. If you want to make it for yourselves, just add more honey or sugar to make it sweeter. I used a heart shaped 18 x 20 cm baking tin but if you are using a round one a 16 – 18 cm diametre one would be fine. Dias was very anxious to eat his cake and while I was taking a picture, he actually licked the cake (as he also did last year) 🙂 . Please note that I’m not a veterinary expert, so before you make the cake, please read carefully the information given in the first cake I made for Dias. Wash and half the apple. Remove the seeds. Put it in a pot with water to cover it and cook until soft, for about ten minutes. Set aside to cool. Put the apple, banana, olive oil, egg, yoghurt, vanilla and honey in a food processor and purée. Empty the mixture in a bowl and mix in the Quaker Oats. Line a small baking tin with parchment paper. (I used a heart shaped 18 x 20 cm). Empty the mixture and bake in a preheated oven to 180o C for about 45 minutes or until a knife inserted in the middle comes out clean. Mix the cream cheese with yoghurt and add a thin layer of cream on top. He ate his share with a great appetite and after trying it to see what it tasted like, I used part of the remaining to make a trifle, using the leftover cream cheese. Beat the heavy cream with the icing sugar and vanilla until stiff. Add the cream cheese and mix. Crumble some of the cake in a bowl and add about 5 cherries with some syrup on top. Add a layer of cream cheese cream, some more crumbled cake and top with another layer of cream cheese. A few days ago it was Dias' (aka Zeus), second birthday and I made him this delicious and easy to make Apple and Banana Olive Oil Cake. All the ingredients used are pure and fresh and it makes a great healthy cake, which can also be eaten by humans. 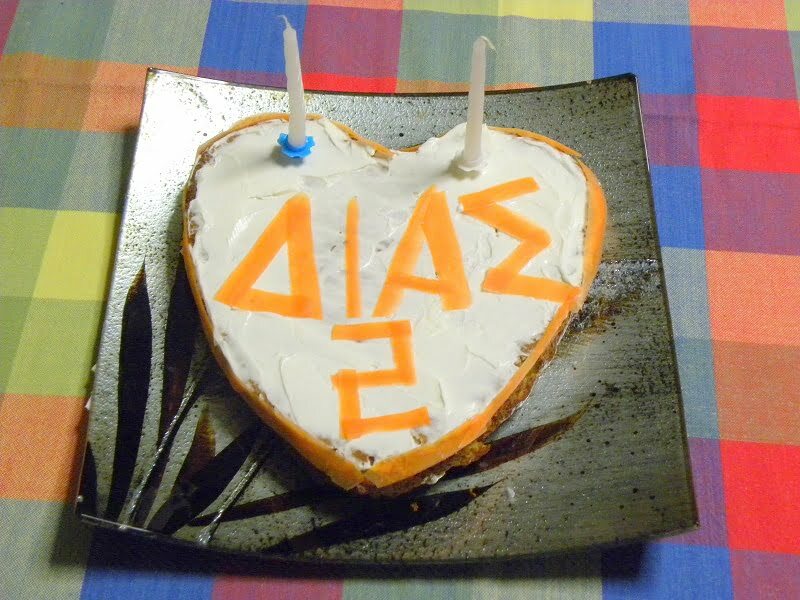 Happy birthday Dias! A cute cake for a cute dog. Thank you Gaye. It’s great to see you back here again! I really love it! Amazing, thank You for sharing with us. I’ve absolutely to try for my pug’s Birthday, Diego 5 years old, coming soon on the next 4th of March!! Thanks for the wonderful natural cake recipe. You have shared great ingredients for dogs and humans. I would always choose banana, apples and other fruits for making cakes to my doggy. Would try this apple banana cake recipe too! Thanks for sharing. I made it for my dog and she loved it! Yummy food for dog. I would definitely eat that! Ivy, thanks for one marvelous posting! I enjoyed reading it; you are a great author.I will make sure to bookmark your blog and may come back someday. I want to encourage that you continue your great posts.